1. Join Toastmasters. If you are in a job or belong to an organization that requires you to speak to groups from time to time, I recommend that you join Toastmasters. Founded almost a century ago, Toastmasters is the world’s largest public speaking organization. With over 240,000 members worldwide, the tools and experiences this organization offers are second to none. Toastmasters gives you a safe and encouraging environment to learn basic speaking skills. When you join, you get a basic manual that includes 10 speeches, each designed to help you develop specific speaking skills. As a member for over 18 years, and I’ve seen many miracles, where people not only overcome the fear of standing in front of an audience, but actually thrive on stage. All it takes is a few basic speeches, and an encouraging audience to go from fear to fun. Toastmasters has local clubs all over the world, which offer a reasonably priced membership, mentorship, and leadership experience. Find a club near you by using the club finder here. 2. Tell a Story. 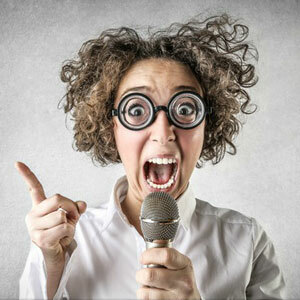 One of the most basic and easy to give speeches is one based on a personal story. For thousands of years, mankind has survived and thrived by passing stories down from generation to generation. We all love a good story. I suggest you base your speech around a story that has conflict, emotion, and offers a solution to a problem. Be real. Make us think, tug at our heartstrings, and give us a reason to take action, all the while adding humor and encouragement. My easy to follow 4H evaluation sheet can help you set it up and deliver it with power. Stories are much easier to remember, and will resonate much better than just facts alone. 3. Outline Your Speech. One of the easiest ways to get comfortable in front of an audience is to outline what you are going to say into easy to remember chunks. Instead of trying to memorize the whole speech word for word, all you need to remember is the bullet points of the outline, to trigger the individual parts of the story. These bullet points can be written down on a small index card for easy reference. When you are new at speaking, this technique will help you create an easy flow and help you move from section to section with ease. Here is a speech outline guide. 4. Create a Powerpoint Story. I have a love-hate relationship with Powerpoint. Many people use it as a crutch when speaking. They put their entire text speech up on the screen in bullet points, and then read from the screen. The audience is bored to death and the speaker quickly loses rapport with their audience. A much better way to use this presentation tool, is to use photographs or graphics to tell a story. Keep the text to a minimum on each slide, and find compelling visuals to illustrate your points. I suggest you create an outline as in tip three, and then create a visual to explain each concept. This puts you as the speaker center stage, and the visuals add emphasis to your speech. Having a laptop setup in presentation mode in front of you, lets you concentrate on the audience and not turn your back to face the screen. A couple of helpful books on the subject are Presentation Zen by Garr Reynolds and Resonate by Nancy Duarte. 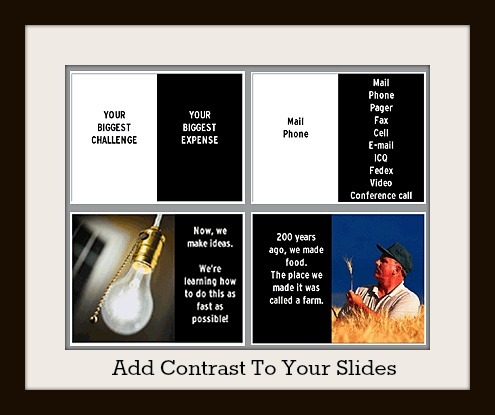 Contrast slides are also helpful. They easily point out the differences between two items. 5. Realize The Audience Wants You To Succeed. When you give a presentation, the audience wants to hear what you have to say. In almost every case, they are on your side. They want to see you do well. Realizing that they are your friend and not your adversary, can help you relax and be yourself. Like a good novel or TV series, give them a compelling story, full of interesting information, with added conflict or intrigue. Bring them in with vivid word pictures, interesting props, or WOW visuals. Put yourself in their seat and design around the experience you would want to have. Become a student of great presentations and learn from the masters. A great book on the subject is Made to Stick by Chip and Dan Heath. Find out how to velcro your presentation into their memory. Overall: Use the tips above to create a wonderful story that your audience is waiting to hear. Don’t settle for a boring, bullet point ridden, snore fest. Give them something better. Share with them a compelling adventure, full of drama and intrigue. Even the most boring technical presentation can be made better. Look for problems, conflicts, and solutions. Present the problem, show the conflict, and offer a solution. Your audience will thank you.